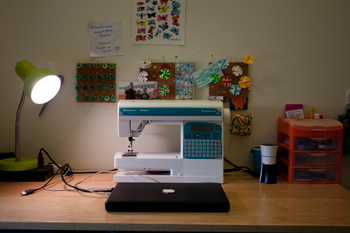 For the last three years, my sewing machine has held center stage on my dorm room desk. I’ve been pressed for space, and I’ve had to choose my projects accordingly, but I haven’t stopped sewing. As a seamstress in college, I need my sewing to keep me sane. It’s a pleasant break from the homework and exams, and it keeps my brain moving. I know I’m not alone in this, so I decided to make this little guide so that nobody has to think, my space is just too small to sew in. My sewing machine is always perched at the back of my desk. 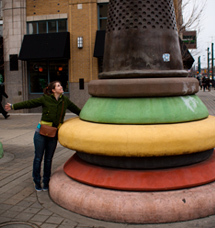 If I were to stow it away in a closet or under my bed, I would only rarely make the effort to get it out. This is what works for me; it allows me to spend less time setting things up and more time creating. I try to keep my desk relatively empty: sewing machine and laptop are housed on top, while the pull-out keyboard tray is where I do most of my book work. When it’s creative time, books, pens, and pencils slide under the desk on the tray and my laptop moves wherever there’s an open spot for it in my room. To create a level sewing surface, I have this portable sewing table that I keep in my closet until sewing time. The legs can be removed, but I leave them on all the time because, again, if I have a chance to sew, I want to be sewing not setting up. When sewing on such a high surface, it’s difficult to maintain good posture. I usually set one of my large textbooks on my chair to make me a bit taller (remember sitting on phonebooks at the dinner table?) and reduce wrist, back, and neck strain. It’s not like I have perfect posture in the first place… but I want to be able to sew ’til I’m 90. If you’re working with interfacing, or articles of clothing that need hems, you’ll need an ironing station. When I worked at Jo-Ann fabrics, one of my colleagues told me, “you can iron on the floor, you’ve got a young back, but it won’t be young for long”. My dinky little dorm ironing board doesn’t have full-sized legs, so sometimes I’ll set it flat on my bed. Having a TV dinner tray around (make sure it’s relatively stable) is even better. Make sure you have a stable place to rest your iron, though… they don’t like falling on the ground. I like to keep my thread and bobbins out in plain sight because it’s a lot easier that way, and they’re colorful and pretty. 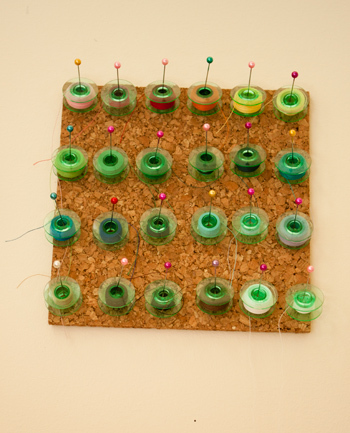 My makeshift bobbin rack is just a 5″ square piece of cork (mounted to the wall using removable foam adhesive mounts) with pins spaced evenly across. I do it this way because I hate bobbin boxes (like this one) because I can never manage to get the lid off without shooting bobbins across the room. okay i’ve got two hours to sew before class, let’s just get out the bobbin…. pop! and there they go! all unwound and under my bed. No more of that. My thread rack came from a big thread storage box I bought, and it had two of these smaller trays. The box is really nice, but I leave it at home with my embroidery threads and just keep one tray with me at school because it’s small and handy. I’ve got a small 3-drawer plastic chest that I keep my favorite fabrics in (the few that make the cut and get to come with me), and a rubbermaid bin on my closet shelf that holds my fleeces, since they’re larger. One drawer of my desk holds my scissors, tape measure, machine feet, and such. My cutting mat stands up next to the fridge, and my iron and ironing board live in the closet. That’s all I really need. Of course, it gets messy sometimes. And of course, I end up accumulating way more crafty things with each trip back home. But it works. This is how I do it. Of course, if you’re trying to set up a sewing station in your room, you’ve got a good creative mind – I’m sure you can think of some great solutions to the small space issues! So my question for you: how do you deal with limited creative space? Are there any products or homemade items that you can’t live without? Thanks for posting this! I am a Family and Consumer Sciences Education major and am always looking for ways to make sewing in my room easier! I love this post. Though I now have a lot of space, there was a time when like you I had to think really carefully about sewing storage. I’m just so impressed you are making space in your dorm room! Great post. I’m a crafty person, too and moving to a tiny dorm room in August really frightens me. I always thought I had to give up sewing and scrapbooking while living in a dorm. But your post has inspired me to try to make it work. I thought I’d have to stick to knitting for the next years as it doesn’t take up much space, haha. Good luck! Let me know if you think of any other nifty storage solutions. I definitely need my sewing at times – it’s just what I do. Hi Quick Question, I lost my craft station in a moving truck accident! 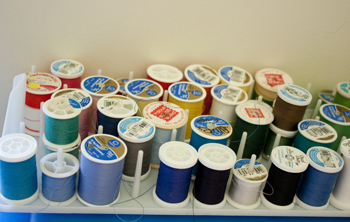 So what do you suggest I need to start my sewing/craft kit back up? There are TOO MANY Choices, for sewing kits! I really like this post. However, how does your roommate deal with the noise? Does she leave, or is she ok with it? I’d like to sew in college also, but I’m afraid I’ll disturb my roommate. That is a really, really good question. It all depends on who your roommate is. I had the best roommate ever, so it worked out, but even then I didn’t sew much when she was in the room – I usually spent that time cutting, pinning, planning, etc. I guess that’s my main answer: you and your roommate will certainly each have times where you have the room to yourself, and that’s the best chance to get sewing done. 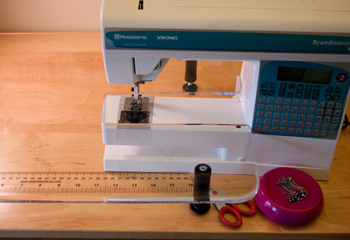 But you could also make your sewing machine’s presence more appealing to your roommate by helping her if she needs something mended or a similar favor. I have my Input here: using a is a great spacesaver too and it is usable when you need it! It has its home at the inside of my closet door. Great post anyway…like the Bobbin-Solution! That’s a great one! I will definitely consider that in my next craft room… such a perfect use of a closet door! 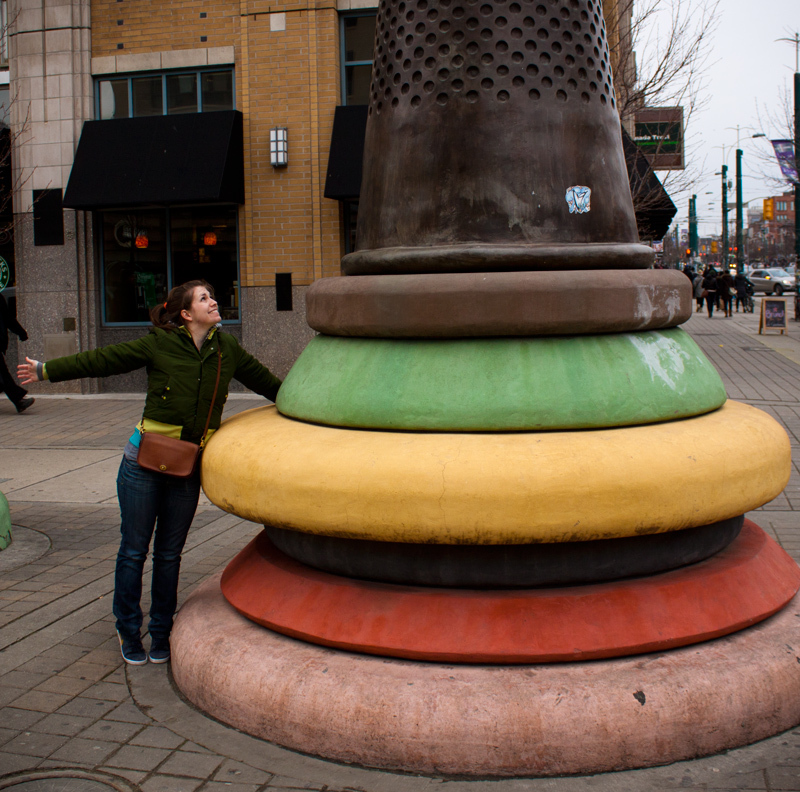 I don’t know how I found your blog but I love it, and I love more the fact that you are a creative engineer! Everyone says that we don’t have a creative side and I’m always fighting for it, so I don’t leave it a side and drowns in math. Love it love it love it!